The Coral Triangle’s extreme species richness is due, in part, to the wide variety and sheer acreage of habitats available for colonization, specialization and evolution. 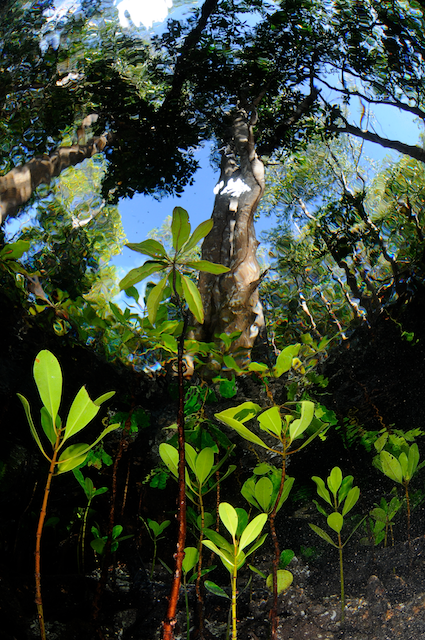 Three habitats are usually considered the ‘big three’ for conservation because of their high productivity, ecological value and superlative biodiversity. 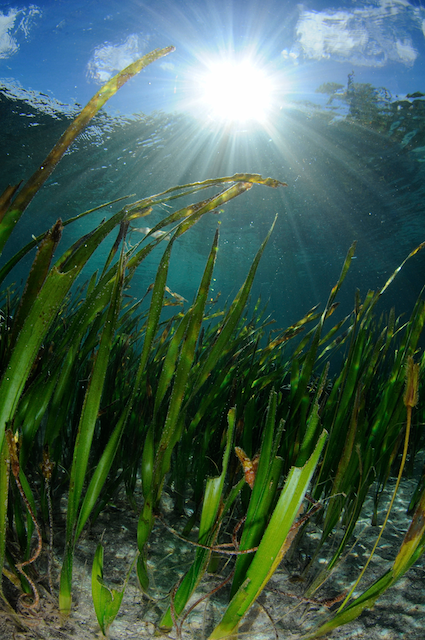 These are coral reefs, seagrass beds and mangroves. Other important habitats include beaches, shallow mudflats, the open seas, deep trenches, migratory passages between islands and seamounts. The Coral Triangle contains at least 600 species of corals which comprises 75% of the world coral species, more than 3000 species of fish, 6 of the world’s 7 species of marine turtles, more seagrass and mangrove species than anywhere else and many more. Critically endangered hawksbill turtles nest throughout the Coral Triangle with the largest populations nesting on several tiny islands in Indonesia, Malaysia and the Philippines. The western Pacific subpopulation of giant Leatherback turtles nest on beaches along New Guinea island (Indonesia and Papua New Guinea) and in the Solomon Islands. 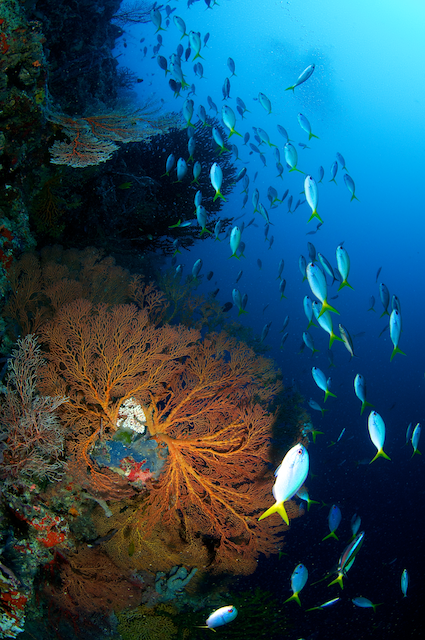 The Coral Triangle’s waters are the most important spawning ground for several species of tuna. The only known population of Coelacanths outside of Africa was found off Indonesia’s Sulawesi Island. 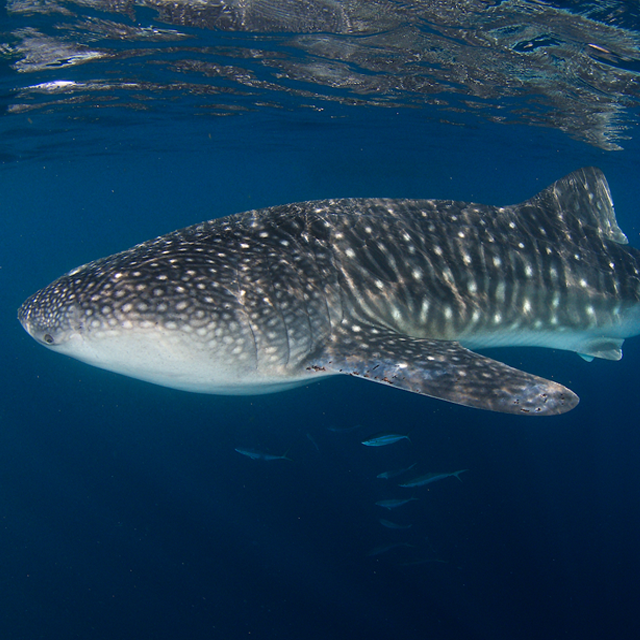 The world’s largest fish, the Whale Shark, can be found throughout the Coral Triangle with regular seasonal aggregations in Donsol, Philippines and Cenderwasih Bay, Indonesia. Marine mammals are widely distributed throughout the region. 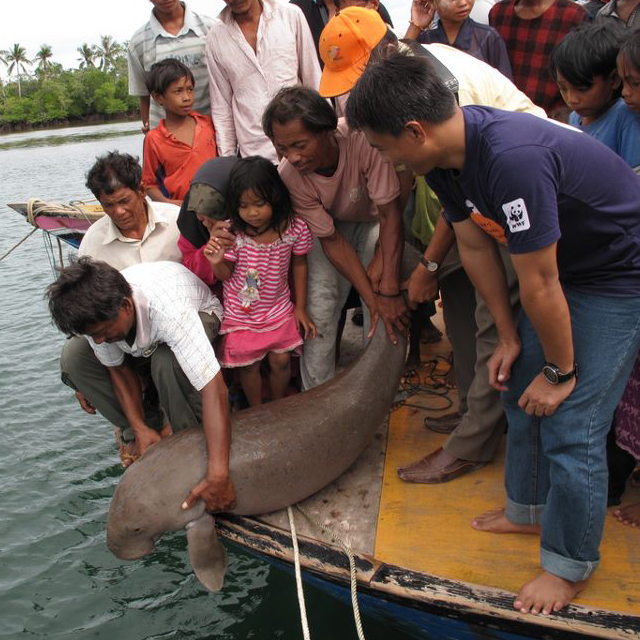 Endangered dugongs are found around the area but in low numbers due to habitat loss and hunting. The world’s largest animal, the Blue Whale and second largest, the Fin Whale are frequently encountered in the seas of Indonesia and Timor Leste. The flagship species concept holds that by raising the profile of a particular species, it can successfully leverage more support for biodiversity conservation at large in a particular context. The Leatherback (Dermochelys coriacea), Green (Chelonia mydas), Hawksbill (Eretmochelys imbricata), Olive Ridley (Lepidochelys olivacea), Loggerhead (Caretta caretta) and Flatback (Natator depressus) sea turtle can all be found within the Coral Triangle. Of these 6 turtles 4 are listed as critically endangered by IUCN and international trade is strictly regulated under CITES (the Convention on International Trade in Endangered Species of Wild Fauna and Flora). 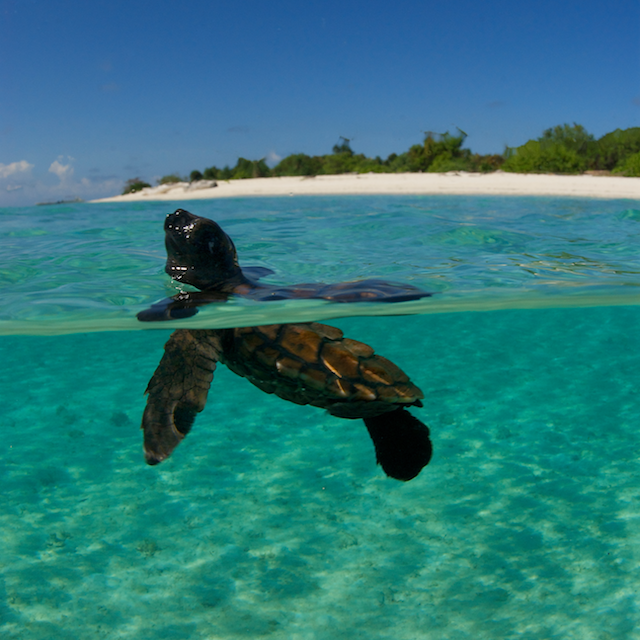 Human threats to sea turtles include the consumption of eggs and hunting of turtles, fishery related bycatch, inappropriate management practices, destruction or modification of nesting habitats and pollution. Well-managed and limited access to some of the nesting beaches has been successfully used in eco-tourism projects in the Turtle Islands in Sabah, Malaysia. The Whale Shark (Rhincodon typus) is the largest fish in the world. 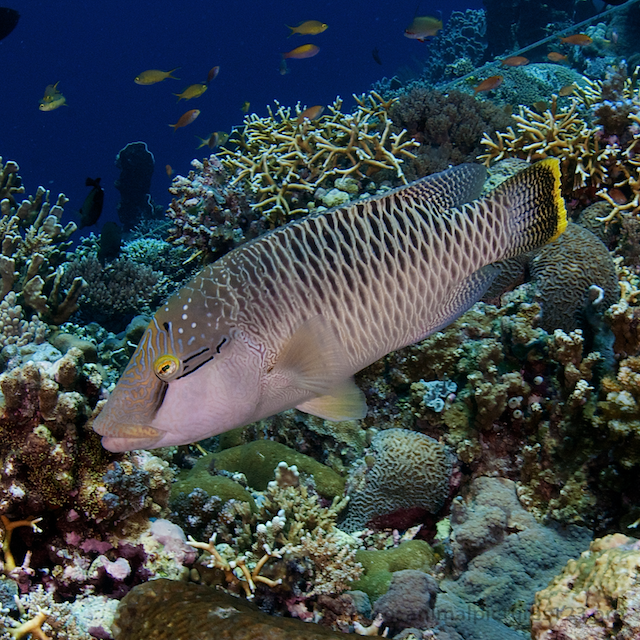 There are several locations within the Coral Triangle where feeding or perhaps even mating aggregations occur: Southern Leyte, Donsol, Pasacao and Tubbataha Reef in the Philippines or Cenderawasih Bay in Indonesia. Whale Sharks are completely harmless to humans, but unfortunately not the other way around; Dried fins from almost all sharks species, including the Whale Shark, fetch enormous prices as an ingredient for shark fin soup, a delicacy in many Asian countries. The Dugong (Dugong dugon), sometimes also called "sea cow", share an ancestral line with elephants, rather than with other marine mammals. The populations of Dugongs in the Coral Triangle are in static decline due to habitat destruction, fishery bycatch and active hunting. While there are sightings of Dugongs reported throughout the Coral Triangle, Palawan and the Tawi-Tawi islands chain in the Philippines as well as Timor-Leste's coast are known to host slightly larger populations. The Humphead wrasse (Cheilinus undulatus) is the largest of all wrasses and is usually spotted around coral reefs. The species has become rare in many parts of the Coral Triangle due to a very large demand as luxury dish in live reef food fish restaurants. The female humphead wrasse can reach an age of over 50 years, but juveniles are often taken from the wild and raised in floating net cages until they are large enough to be sold to restaurants. There are many grouper species living in the Coral Triangle. Most groupers are slow growing and reach sexual maturity only after several years. Groupers are heavily targeted by fishermen because of their high value as live reef food fish. Especially vulnerable are grouper spawning aggregations, when whole populations are in danger of being caught at once. 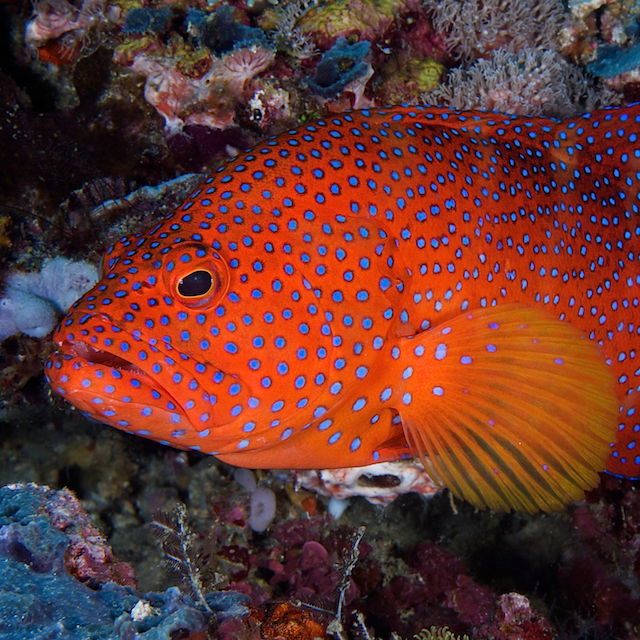 The Coral Grouper (Cephalopholis miniata) is one of the more popular food fish species for it's deep red skin colour, a sign of prosperity in some Asian cultures. 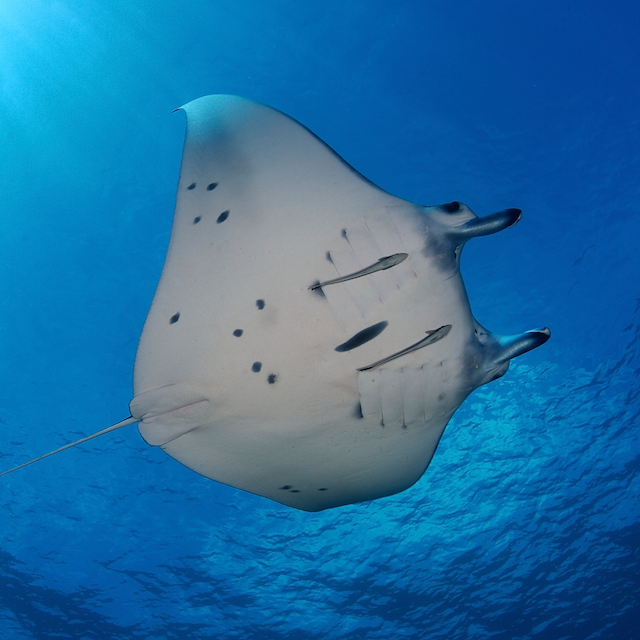 Manta and Mobula rays are probably some of the most charismatic species you can encounter in the Coral Triangle. The largest Manta species (Manta bistrosis) can reach wing spans of up to 7 meters and a weight of 2000 kg. These impressive rays sometime aggregate at cleaning stations or for feeding in plankton rich waters. Threads to Mantas & Mobulas are coming from accidentally entanglement in long-line and net-fishing gear as well from fishermen targeting them for food and their gill rakers, which are desired in traditional Chinese medicine. Pygmy seahorses are extremely well camouflaged tiny fish who form close relationships with a host plant or animal, such as gorgonians or hydrazoans . There are currently 9 species known, most of which have only been described and named within this century. Pygmy seahorses came to sudden "fame" through the interest by underwater photographers from around the world to capture and publish images of these interesting critters. 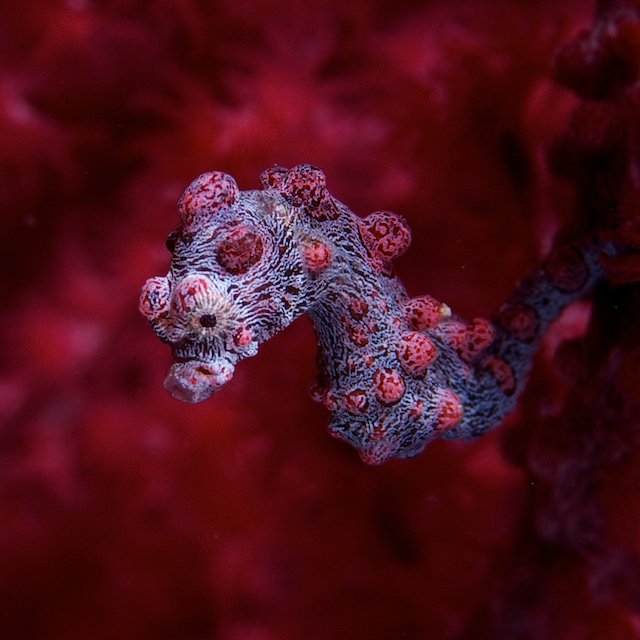 Pygmy seahorses are threatened by too much attention from photographers and general degradation of coral reefs, while their larger cousins are caught for the Traditional Chinese Medicine Trade. Sperm whales can be found throughout the Coral Triangle, but the most frequent sightings have been reported in the Savu Sea in Indonesia and around Timor-Leste. 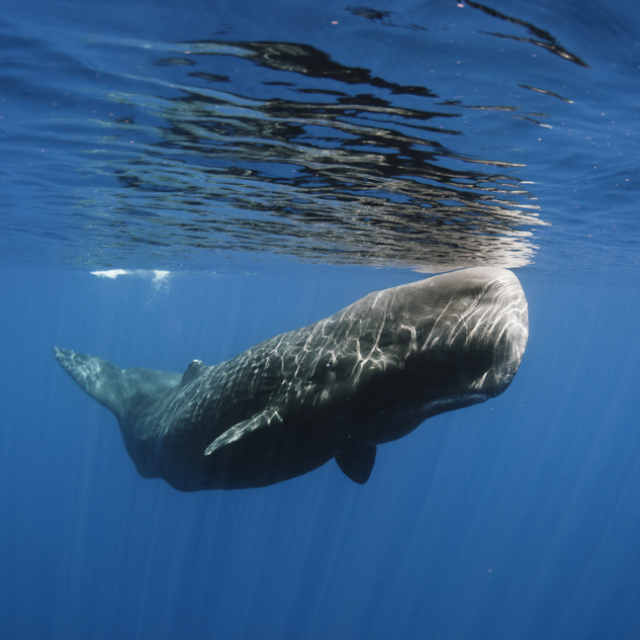 Male sperm whales may reach 20 meters in length and have the largest brain of any animal on earth. These marine mammals are extreme deep divers, plunging to 2000 meters and more on the search for their primary food, squids. Sperm whale hunting has a long tradition with natives of Indonesia, long before commercial whaling started in the 18th century. Even today there are still villages in Flores practicing seasonal whaling in a traditional way, using wooden boats and hand thrown spears. Also known as the ocean sunfish, the Mola-Mola is the most common of 3 species in the Molidae family. The Mola-Mola is the largest bony fish on the planet and can reach more than 2000 kg in weight. 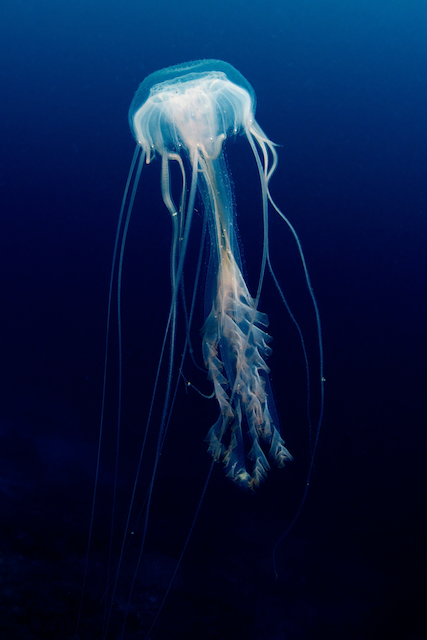 This fish feeds primarily on jellyfish, but also on squid, sponges and crustaceans. 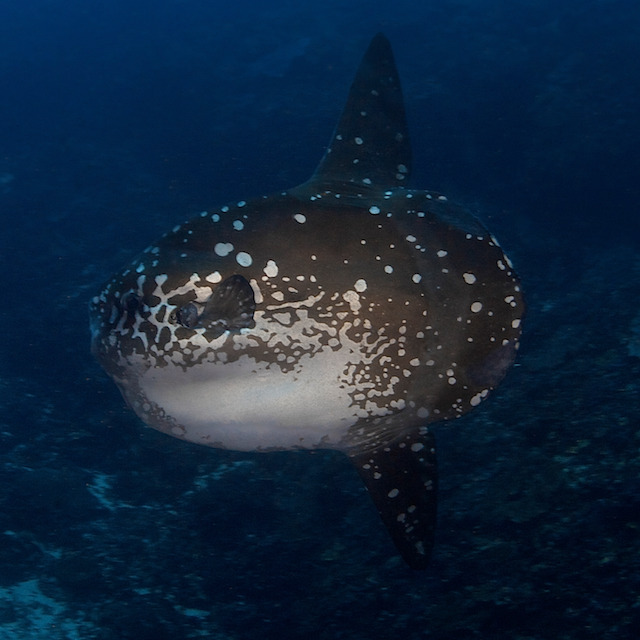 Mola-mola around found in open water all over the Coral Triangle, but usually sightings are by chance. Around Bali, Indonesia, Mola-Mola tend to visit cleaning stations and can be easily observed during the cold-water upwelling season. Human threats to the Mola-Mola come mostly in the form of entanglement in large commercial drift nets. Anemone or clown fish belong to the large family of damsel fish. 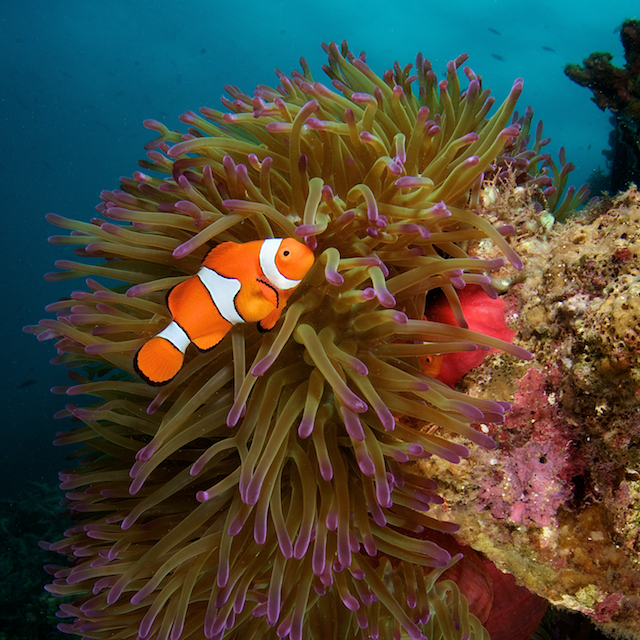 The great majority of anemone fish species are only found in the Coral Triangle and adjacent countries. They are called anemone fish because they live in a symbiotic relationship with sea anemones. They might well be the most photographed fish on this planet and have become synonomys with tropical coral reefs. Anemone fish are extremely popular with aquarium keepers, which makes them vulnerable to over-collecting.